Do you ever see a product advertised as green and wonder “how does it affect me?” To most people, a green home is not much different. It can be difficult to understand what makes a home green because there are lots of products, processes and resources that come together when a new home is built. To sum it up, green homes are energy efficient, durable and provide a healthy living environment. 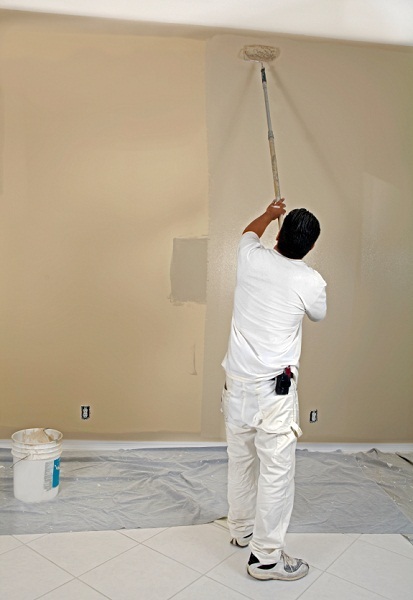 One green product that leads to a healthier house is low VOC paint. The indoor air quality of a home can be drastically affected by various products used inside the home. Many of today’s building products contain adhesives, paints or stains which commonly contain harmful substances called VOCs, also known as volatile organic compounds. VOCs are emitted from products as a gas, meaning that the VOCs can be in the air that we breath. Since paint covers more surface area than any other product in your home, a product with high VOCs can potentially affect your health with both long and short term effects. Read more about the EPA’s stance on indoor air quality in the Care for Your Air guide. As part of our green commitment to Betenbough homeowners, we are currently using low VOC paint from Sherwin Williams on our walls and trim as well as low VOC stain from Sherwin Williams on our cabinets.